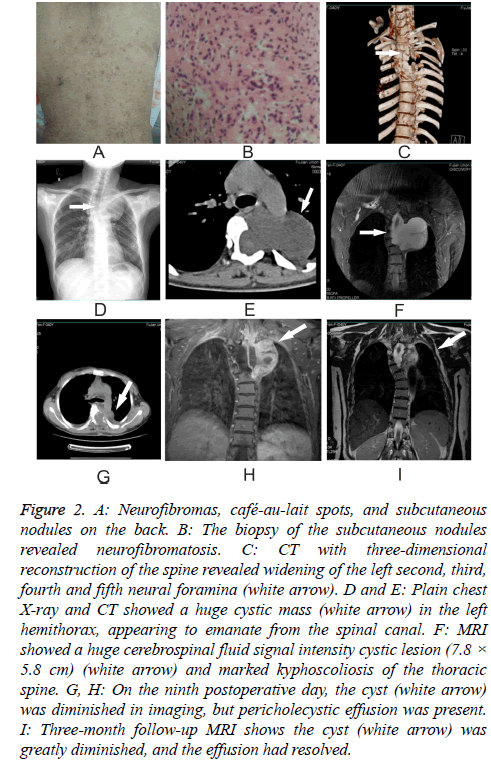 Neurofibromatosis type-1 (NF-1) associated-intrathoracic meningocele is a rare clinical finding. We report the cases of two adults who were diagnosed with NF-1-associated intrathoracic meningoceles and successfully treated with a novel surgical technique called “dural turnover repair method.” Both patients were symptomatic. Preoperative imaging showed a cystic lesion in the thoracic cavity of both patients. Their symptoms were relieved and the cysts were markedly diminished postoperatively. Neither patient experienced complications from the operation. We wish to emphasize that the novel “dural turnover repair method” is effective in the treatment of intrathoracic meningocele associated with NF-1. Dural turnover repair method, Intrathoracic meningocele, Neurofibromatosis type-1. CT: Computed Tomography; MRI: Magnetic Resonance Imaging; NF-1: Neurofibromatosis type 1. Here we report two cases of intrathoracic meningocele associated with NF-1, where our patients recovered from dyspnea and thoracic radicular pain after surgery consisting of posterior partial laminectomy with the “dural turnover repair method” employed to correct the meningeal defect (Figures 1A-1C). 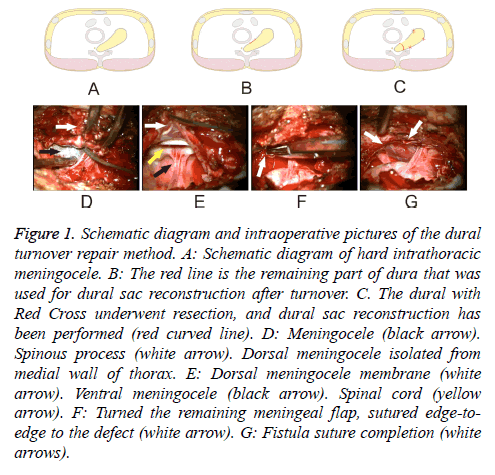 Figure 1: Schematic diagram and intraoperative pictures of the dural turnover repair method. A: Schematic diagram of hard intrathoracic meningocele. B: The red line is the remaining part of dura that was used for dural sac reconstruction after turnover. C. The dural with Red Cross underwent resection, and dural sac reconstruction has been performed (red curved line). D: Meningocele (black arrow). Spinous process (white arrow). Dorsal meningocele isolated from medial wall of thorax. E: Dorsal meningocele membrane (white arrow). Ventral meningocele (black arrow). Spinal cord (yellow arrow). F: Turned the remaining meningeal flap, sutured edge-toedge to the defect (white arrow). G: Fistula suture completion (white arrows). A 45 y old woman who had suffered from NF-1 for more than 10 y presented to the Neurology Department complaining of dyspnea on exertion for three months. Her dyspnea had progressed over the three days immediately preceding her visit to the point that she was dyspneic even at rest. On examination, we found abundant neurofibromas and café-aulait spots as well as subcutaneous nodules, most of them on the back (Figure 2A). Biopsy of the subcutaneous nodules disclosed neurofibromatosis (Figure 2B). MRI showed a huge cerebrospinal fluid signal intensity cystic lesion (7.8 × 5.8 cm) and marked kyphoscoliosis of the thoracic spine (Figure 2F). CT scan with three-dimensional reconstruction of the spine revealed widening of the left second, third, fourth and fifth neural foramina (Figure 2C). After signing a consent form, she was taken to the operating room to undergo surgery. Figure 2: A: Neurofibromas, café-au-lait spots, and subcutaneous nodules on the back. B: The biopsy of the subcutaneous nodules revealed neurofibromatosis. C: CT with three-dimensional reconstruction of the spine revealed widening of the left second, third, fourth and fifth neural foramina (white arrow). D and E: Plain chest X-ray and CT showed a huge cystic mass (white arrow) in the left hemithorax, appearing to emanate from the spinal canal. F: MRI showed a huge cerebrospinal fluid signal intensity cystic lesion (7.8 × 5.8 cm) (white arrow) and marked kyphoscoliosis of the thoracic spine. G, H: On the ninth postoperative day, the cyst (white arrow) was diminished in imaging, but pericholecystic effusion was present. I: Three-month follow-up MRI shows the cyst (white arrow) was greatly diminished, and the effusion had resolved. After administration of general anesthesia, the patient was placed in prone position. A posterior thoracic median incision was made from T2 to T5 about 10 cm in length. The appropriate operative level was ascertained under plain film. Separation of subcutaneous tissue and muscle fascia was performed to exposing the laminae. The left-sided hemilaminae and spinous processes of T2-T5 were removed with ultrasound knife. After entering the spinal canal, the meningocele (Figure 1D) was plainly visible with clear boundaries. Careful stripping of the unwanted meningocele from the parietal pleura was done to prevent damage to the pleura. The membrane of the bulging part of the meningocele was relatively thin. It was incised sharply with a knife and microscissors, permitting slow release of cerebrospinal fluid, which was aspirated out of the field. The dorsal meningocele membrane, ventral meningocele membrane and spinal cord were clearly visible after cerebrospinal fluid release (Figure 1E). With tension in the cyst relieved, excess membrane tissue of the meningocele was excised, with care to retain enough tissue to close the defect. To protect the nerve and spinal cord, we ensured that there were no nerve fibers in the capsule cavity before closing the dura. Then the remaining meningeal flap was turned down and sutured edge-to-edge to the base of the defect (Figure 1F). Dural reconstruction was, thus, completed in layered, watertight fashion, followed by application of dural film patch and biological protein glue to prevent CSF leakage. On the third postoperative day, the patient’s dyspnea was appreciably improved. On the ninth postoperative day, the cyst was diminished on MRI imaging (Figures 2G and 2H), but pericholecystic effusion was present. By the three-month follow-up examination, however, the patient reported experiencing no downstream complications, and the cyst was diminished massively in imaging, with the effusion having resolved (Figure 2I). A 53 y old man presented to the Neurology Department with left-sided thoracic radicular pain for one month. He reported that 20 y previously he was diagnosed with NF-1. He also had a moderate thoracic vertebral deformity. Kyphoscoliosis was confirmed on careful physical examination. Plain chest X-ray and CT showed a huge cystic mass in the left hemithorax (Figures 3A and 3B). MRI revealed kyphoscoliosis and a cystic tumor in the left thoracic cavity emanating from the spinal canal (Figures 3C and 3D). He was then taken to the operating room after signing a consent form. Figure 3: A and B: Plain chest X-ray and CT show a huge cystic mass (white arrow) in the left hemithorax. C and D: MRI revealed kyphoscoliosis and a cystic tumor in the left thoracic cavity, emanating from the spinal canal. E and F: Postoperative chest imaging three months later showed marked regression of the intrathoracic meningocele. The same surgical method that was used in Case 1 was employed here because of the similar positions and sizes of the cysts, though the skin incision was made 2 cm left of the midline in the region of T1 through T4. The operation was completed successfully. The three-month followup MRI (Figures 3E and 3F) shows the cyst was impressively diminished. Linkage studies have shown that the NF-1 gene is located on human chromosome 17q 11.2 zone. The diversity and complexity of gene mutations is due to the large span of the gene, 350 kb, and the lack of a hot spot, which makes it difficult to monitor the gene mutation. The NF-1 gene encoding protein, neurofibromin, by inhibiting the RAS signaling pathway, establishes the tumor-suppressive role of the gene, so NF-1 gene mutation may increase their risk of cancer. Some patients experience complications such as vascular disease, limb movement disorder, bone hypoplasia, and, more rarely, perforated appendiceal diverticulitis. Diagnostic criteria for NF-1 were developed by the National Consensus Development Conference of the National Institutes of Health in 1987. The pathogenesis of intrathoracic meningocele remains controversial. Rainov proffered that it might occur in neurofibromatosis patients secondary to congenital mesodermal dysplasia and hypoplastic bone changes . Andrade related dural dysplasia in patients with neurofibromatosis to enlargement of intervertebral foramina . Ogose offered that trauma and history of surgery to the spinal cord could lead to development of intrathoracic meningocele . Martelli et al. pointed out that, since a bulging meningocele can compress and even damage the nearby intercostal nerve, resultant symptoms may be used to identify the level of the meningocele . Turgut  opined that vertebral corpus defects may play a role in the etiology of intrathoracic meningocele. Whether or not surgical options should be pursued depends on the patient's symptoms and the size of the cyst. Zamponi  and Zuo  recommend that the patient without symptoms referable to the cyst be followed radiologically and only be offered surgery if the cyst increases in size to the point that it becomes clinically symptomatic. In that case, surgery would be indicated. Conversely, Ayodeji  recommends that operation be performed as early as possible to avert any future complication of spontaneous hemorrhage. Laminotomy of one side is considered when the cyst is small and costotransversectomy when the cyst is large. For patients with scoliosis, posterior fusion may be necessary to prevent destabilization of the spine . Vanhauwaert  recommends cerebrospinal fluid drainage in the high-risk patient where the function of one lung is impaired. Tanaka offers an even lowerrisk surgical option for giant intrathoracic meningocel-insertion of a cystoperitoneal shunt under local anesthesia . This simple, minimally invasive treatment is a valuable alternative for high-risk patients, especially those with compromised respiratory function. Andrade asserts that the transthoracic approach is the better choice for the large-volume cyst to avoid injury to the spinal cord . Cho reports a case in which a thoracic cavity cyst was drained of cerebrospinal fluid via lumbar puncture . On survey, we found an additional 13 cases with intrathoracic meningoceles described in the literature from 2002 through 2015 (Table 1) [5,8,11,13-21], 11 having relationship with NF. Among these 11 cases with NF, seven were females and four were males, ages varying from 16 to 66 y, most of them complaining of thoracic pain or dyspnea. Among those patients, most underwent positive treatment like surgery or shunt; only one patient accepted conservative treatment. One of the patient’s treatment methods was not mentioned. Table 1. Neurofibromatosis type l with intrathoracic meningoceles 2000-2015. The most serious complication of intrathoracic meningoceles is spontaneous cyst rupture, which can lead to pleural effusion or hemothorax. Chest wall hematoma may develop as a result of internal thoracic artery invasion by the cyst . Vimal  reported a case of rupture of a thoracic meningocele into the pleural cavity that led to spontaneous subarachnoid pleural fistula, which was resolved with insertion of a lumbar cystoperitoneal shunt. Martelli et al. reported that the perioperative complication rate of cerebrospinal fluid pleural fistula was 7.5%. Nakai  reported the case of a 16 y old boy who was treated with lesion resection wherein the surgery was successful but paraplegia occurred on the first postoperative day with normal intraspinal pressure. There is little discussion in the relevant literature on surgical techniques for closure of intrathoracic meningocele. Chen  describes application of a pursestring suture to close the meningeal defect. Zuo  describes closure of the defect with a continuous suture of 3-0 Prolene. We developed a method that consists of “turning over” the bulging part of the meningocele and excising any attenuated tissue in excess of what is required to close the defect. This method, called “dural turnover repair method,” offers the distinct advantage of accessing the large intrathoracic cyst from a posterior approach. In addition, by preserving a sufficient portion of meningocele membrane tissue, we can ensure a smoother, tension-free repair that resides comfortably in the native spinal canal space. To our knowledge, this method has not been mentioned in the literature before. Therefore, it is a novel surgical method for the treatment of intrathoracic meningocele. The authors would like to thank Clarity Manuscript Consultant LLC (Indianapolis) for their language editing assistance. The data and material are freely available upon requests. Please contact Dr. Chun-Mei Chen ([email protected]) for further information, who is responsible for the dataset. ZW-C and W-Z contributed equally to this work and should be considered co-first author. ZW-C and W-Z drafted this manuscript. ZW-C, W-Z, RZ-C and CH-W were involved in the acquisition of data and preparing the figures. CM-C conceived of the study and revised the manuscript. All authors read and approved the final manuscript. The consent for publication of the individual patient data from the patient has been obtained by the Fujian Medical University Union Hospital from the patient’s legal guardian. The Ethics Committee of the Union Hospital of Fujian Medical University approved this study. The analysis was performed in accordance with the ethical standards of the hospital and the tenets of the Declaration of Helsinki/Declaration of Istanbul. The patient reported in this study provided written consent. Rubin S, Stratemeier EH. 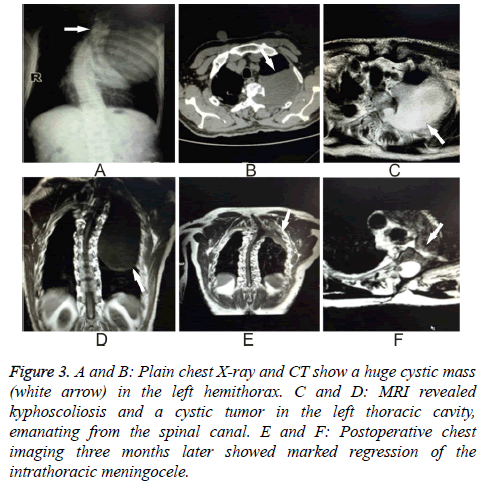 Intrathoracic meningocele: a case report. Radiol 1952; 58: 552-555. Phol R. Meningocele in brustraum uter dem bilde eines intra-thoraken rundschauttens. Rontgenpraxis 1933; 5: 747-749. Nanson EM. Thoracic meningocele associated with neurofibromatosis. J Thorac Surg 1957; 33: 650-662. Rainov NG, Heidecke V, Burkert W. Thoracic and lumbar meningocele in neurofibromatosis type 1. Report of two cases and review of the literature. Neurosurg Rev 1995; 18: 127-134. Andrade GCD, Braga OP, Hisatugo KI. Giant intrathoracic meningoceles associated with cutaneous neurofibromatosis type 1. Arquivos de Neuro-Psiquiatria 2003; 61: 677-681. Ogose A, Hirano T, Hasegawa K. Tumoral nature of intrathoracic meningocele in neurofibromatosis. Neurology 2002; 59: 1467-1468. Martelli M, Treggiari S, Capece G. Intrathoracic meningocele. A case report and review of the literature. Minerva Chirurgica 1992; 47: 1845-1857. Turgut M, Alhan C, Cihangiroglu M. Isolated giant intrathoracic meningocele associated with vertebral corpus deformity. Interactive Cardiovasc Thorac Surg 2004; 3: 381-383. Zamponi C, Cervoni L, Caruso R. Large intrathoracic meningocele in a patient with neurofibromatosis.Case report. Neurosurg Ver 1996; 19: 275-277. Zuo T, Ni Z, Zhou M. Large intrathoracic meningocele in a patient with neurofibromatosis type 1.Asian Cardiovasc Thorac Ann 2014; 22: 219-221. Yusuf AS, Pillai A, Menon SK. Massive spontaneous hemothorax, giant intrathoracic meningocele, and kyphoscoliosis in neurofibromatosis type 1. J Surg Tech Case Rep 2014; 6: 33-36. Vanhauwaert DJ, Deruytter MJ. Cystoperitoneal shunt as alternative treatment for a giant thoracic meningocele in a patient with neurofibromatosis. Surg Neurol 2008; 69: 535-537. Tanaka K, Shimizu K, Kakegawa S. Cystoperitoneal shunt for a giant intrathoracic meningocele under local anesthesia. Ann Thorac Surg 2011; 91: 317-319. Cho DG, Yong JC, Cho KD. Collaborative treatment of huge intrathoracic meningoceles associated with neurofibromatosis type 1: a case report. J Cardiothorac Surg 2015; 10: 1-4. Chen HC, Chang PH, Jhang SW. Thoracoscopic plication for a huge thoracic meningocele in a patient with neurofibromatosis. J Cardiothorac Surg 2014; 9: 179. Huang TW, Huang HP, Ye QY. A neurofibromatosis type 1 patient with thoracic encapsulated fluid and intracranial hypotension syndrome: a case report. Neurologist 2011; 17: 167-171. Kaneda H, Saito T, Konobu T. Chest wall bleeding with giant intrathoracic meningocele in neurofibromatosis type 1. Interact Cardiovasc Thorac Surg 2011; 12: 328-330. Kumar V, Bundela YS, Gupta V. Spontaneous subarachnoid pleural fistula: a rare complication of lateral thoracic meningocele. Neurol Ind 2010; 58: 466-467. Nakai S, Ibe S, Otani K. Paraparesis after excision of intrathoracic meningoceles in a patient with neurofibromatosis. J Orthop Sci 2002; 7: 143-146. Swetz KM, Spinner RJ. Large intrathoracic meningocele associated with neurofibromatosis type 1. Mayo Clinic Proc 2009; 84: 769. Walcott BP, Kahle KT, Wain JC. Giant thoracic meningocele associated with neurofibromatosis 1. Neurology 2011; 76: 1943.